A GREAT GUEST HOUSE IN UGANDA. NAMIREMBE with the Million Dollar View. The Bill & Melinda Gates Foundation today announced that it will commit $50 million to support the scale up of emergency efforts to contain the Ebola outbreak in West Africa and interrupt transmission of the virus. "We are working urgently with our partners to identify the most effective ways to help them save lives now and stop transmission of this deadly disease," said Sue Desmond-Hellmann, CEO of the Gates Foundation. "We also want to accelerate the development of treatments, vaccines and diagnostics that can help end this epidemic and prevent future outbreaks." To date, the Gates Foundation has committed more than $10 million to fight the Ebola outbreak, including $5 million to WHO for emergency operations and R&D assessments and $5 million to the U.S. Fund for UNICEF to support efforts in Liberia, Sierra Leone and Guinea to purchase essential medical supplies, coordinate response activities, and provide at-risk communities with life-saving health information. An additional $2 million will also be committed immediately to the Centers for Disease Control and Prevention to support incident management, treatment, and health care system strengthening. 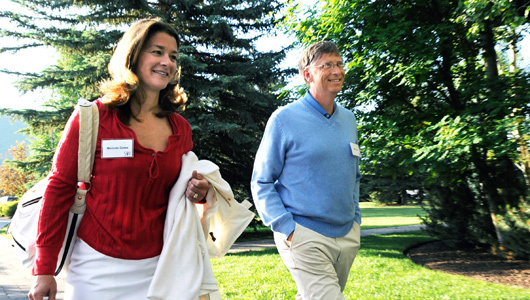 HARARE � Bill and Melinda Gates (pictured) foundation has come back to Harare again but this time around, the philanthropists are coming in as investors. The US- based organisation headed by former Microsoft chairman, Bill Gates, who, according to Forbes Magazine, is the second richest man in the world is looking for means of investing in Zimbabwe. Harare Mayor Muchadeyi Masunda told the Daily News on Sunday the Seattle- based foundation which has an estimated wealth of $56 billion, was exploring means of investing in Harare � targeting raw sewer and other disposable waste with a view of turning it into energy. �The Bill and Melinda Gates Foundation has engaged a team of consultants led by Peter Smuts of Pasco Waste and Environmental Consulting to have a look at our solid waste with a view of assisting us with the installation of facilities to convert waste into money,� said Masunda. According to Masunda, the project will address at least two of the eight Millennium Development Goals (MDGs), of eradicating poverty by creating employment and reducing environmental degradation through the elimination of industrial and domestic pollution. �Council shall push for a tripartite business model involving itself as the designated local authority, the Bill and Melinda Gates Foundation in conjunction with a local or foreign technical partner and the community where the waste is being generated,� Masunda said. The envisioned venture between council and the foundation follows a successful visit by Melanie Walker, a senior programme officer last year to monitor a $5 million housing grant sponsored by the organisation. The project initially targeted Mbare residents, but was later moved to Dzivaresekwa due to political resistance from a Zanu PF-aligned group � Chipangano. The �notorious� group, described by Masunda as �loose cannons,� successfully scuttled hopes of more than 500 Mbare families to benefit from an ambitious housing project. They demanded a share into the project before accusing the initiative of being an MDC election campaigning gimmick. Harare City Council just like many other urban local authorities is directly controlled by the Morgan Tsvangirai-led MDC. Masunda could not divulge the exact amount the project will cost preferring to estimate that an initial capital injection of $1 million is hoped for. The Bill & Melinda Gates Foundation have provided the Alliance for a Green Revolution in Africa (AGRA) with a $56 million grant to support agriculture in sub-Saharan Africa. The money will be utilized by AGRA to provide disease resistant seeds of important crops that produce higher yields to poor farmers. It is hoped that this will help to increase their productivity and reduce hunger and poverty. AGRA�s Program for Africa�s Seed System (PASS) has been largely successful since its launch five years ago. PASS programme director, Dr. Joe Devries said, �In Africa , farmers have largely not benefited from improved seeds due to a lack of localized crop breeding and efficient, dependable seed delivery system. And so crop yields in most of Africa have remained one-third of those produced by farmers in other developing regions of the worlds. PASS aims to increase the number of companies providing it with seeds to 100 by 2017, and improve its capacity to 200,000 metric tonnes of seeds to support 10 million small farmers. The grant was announce by the co-Chair of the Bill and Melinda Gates Foundation in Rome during the International Fund for Agriculture (IFAD) annual governing session. The Foundation has contributed $2 billion to Agriculture since 2006. Bill Gates speaking at the session said, �If you care about the poorest, you care about agriculture. Bill and Melinda Gates believe every life has equal value. 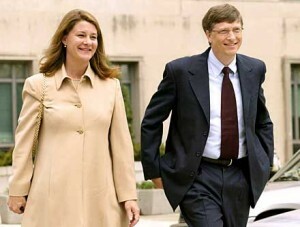 In 2000, they created the Bill & Melinda Gates Foundation to help reduce inequities in the United States and around the world. Headquartered in Seattle, Washington, the foundation is led by co-chairs Bill Gates, Melinda Gates, and William H. Gates Sr., and by CEO Patty Stonesifer. We want to support African farmers, who produce food under the most difficult conditions, by improving the agricultural sector from seed to market. Philanthropists Bill and Melinda Gates pitched an optimistic future for the world's poor and sick in their annual letter, arguing passionately against three myths they say hurt efforts to bring people out of poverty, save lives and improve living conditions. In the past, their annual letter has focused exclusively on the Bill & Melinda Gates Foundation's activities. But in their sixth letter published Tuesday, the co-chairs of the world's largest charitable foundation sought to dispel false notions that poor countries are doomed to stay poor, that foreign aid is wasteful and that saving lives will cause overpopulation. "All three reflect a dim view of the future, one that says the world isn't improving but staying poor and sick, and getting overcrowded," Bill Gates writes in the 16-page letter. "We're going to make the opposite case, that the world is getting better, and that in two decades it will be better still." Gates says GDP per capita figures, adjusted for inflation to 2005 dollars, show that many countries such as China, India, Brazil and even Botswana that were once considered poor now have growing economies. And in Africa, a place the Microsoft co-founder says is all too often dismissed as hopeless, life expectancy has risen since the 1960s despite the HIV epidemic. Also, more children are going to school and fewer people are hungry. "I am optimistic enough about this that I am willing to make a prediction," he said. "By 2035, there will be almost no poor countries left in the world." CBC's As It Happens host Carol Off asked Bill Gates whether he had taken into account the impact that climate change could have by 2035, especially on fragile emerging economies' water and food levels. "I do mention that as you get countries to be affluent - other problems come with that," Gates said to Off, responding that development is important, but local environment issues and health problems will also need to be addressed. Gates added that 90 per cent of climate change is caused by "rich countries," and that the poor will suffer for it. Gates says that development aid � for instance making drought-resistant seeds available to poor farmers � would mitigate the effects of climate change. He says that this is one area where foreign aid could help poorer countries improve productivity and avert starvation. He argues against claims that foreign aid is wasteful because it is too expensive, because it is stolen by corrupt officials receiving it or because countries who receive it become dependent on it. "There are people who will take the worst programs that didn't succeed in their goals and hold them up as though they're representative," Gates says. He says that in Norway, the world's most generous donor of foreign aid, the amount of its budget that goes to foreign aid is only three per cent. In the U.S., it's less than one per cent, or about $30 billion per year, of which $11 billion goes to vaccines, bed nets and other health causes. Measles vaccinations, eradicating smallpox, controlling tuberculosis in China and a plan to eliminate polio in Latin America are all public health efforts achieved with aid funding. "Health aid is a phenomenal investment," he writes. "When I look at how many fewer children are dying than 30 years ago, and how many people are living longer and healthier lives, I get quite optimistic about the future." His wife, Melinda, wrote a section of the letter dispelling the myth that saving lives worldwide will lead to overpopulation. She points to countries such as Brazil where both child mortality and birth rates have declined. When more children survive, she says, parents have smaller families. "We've developed a real excitement about the progress we see," says Gates. "The planet does not thrive when the sickest are allowed to die off,but rather when they are able to improve their lives" she says. "Human beings are not machines. We don't reproduce mindlessly. We make decisions based on the circumstances we face"
The Seattle-based Bill & Melinda Gates Foundation is the world's largest charitable foundation and has made $28.3 billion in grant payments since its inception 13 years ago.